Word processing used to be the authoring tool par excellence. Thanks to extensive formatting functions and embedded tables and graphics, anyone can create beautiful and informative documents one way or another, and word processing seems like incredible progress compared with the pen or typewriter. However, many users do not take full advantage of all the word processing tools that are available. Moreover, many can do without tables of contents, headers and footers, and like elements and consider toolbars and layout-based work a distraction from what's most essential: writing. Even if you do manage to concentrate on the text, system messages and other invasive events can distract you from your text creation. For example, as soon as you're engrossed in your work, an IM comes across from one of your pals or the operating system notifies you of six urgent software upgrades. Tools for "distraction-free writing" can help remedy this situation. They bring the old empty page metaphor back to life by opening a page in full-screen mode and eliminating everything else. The author sees only the empty page and the rest disappears into the background. The functions are reduced to a bare minimum. The idea is to format the text later in another program or hand it over to someone else to perform the layout. One of these tools is FocusWriter , the work of Graeme Gott, which can be installed easily from the Software Center. After starting FocusWriter, you'll see only a gray background and a blinking cursor (Figure 1). The Spartan landscape is disrupted by neither a menubar nor a frame, and you can start writing immediately without distraction. 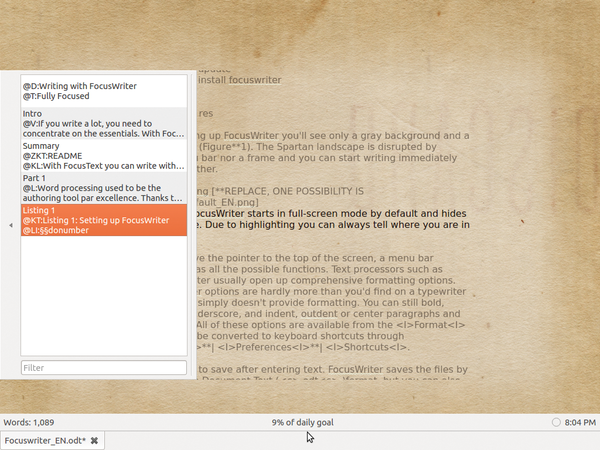 Figure 1: FocusWriter starts in full-screen mode by default and hides everything else. Thanks to highlighting, you can always tell where you are in the text. As you move the pointer to the top of the screen, a menubar appears that has all the possible functions. 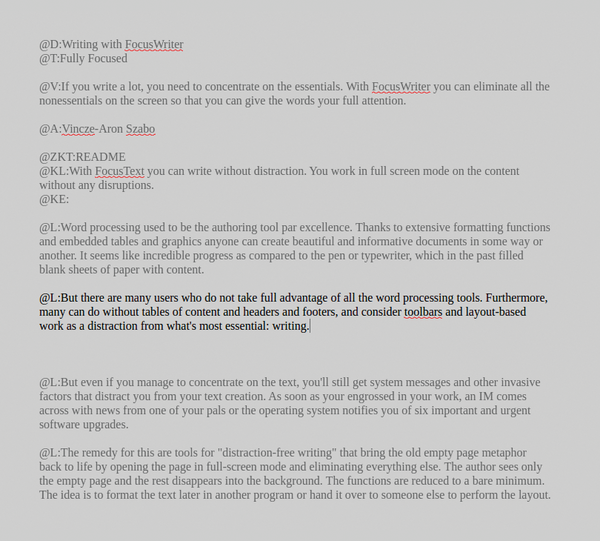 Text processors (e.g., OpenOffice Writer) usually present comprehensive formatting options. The FocusWriter options are hardly more than you'd find on a typewriter – the program simply doesn't provide advanced formatting. You can still bold, italicize, and underscore, as well as indent, outdent, or center paragraphs and blocks of text. All of these options are available from the Format menu and can be converted to keyboard shortcuts through Settings | Preferences | Shortcuts . Remember to save after entering text. FocusWriter saves the files by default in Open Document Text (.odt ) format, but you can also save in rich text format (RTF). Moving the mouse to the left of the screen opens so-called Scene view (on the left in Figure 2). In this view, which opens when you prefix text with double hashes (##), you can segment text into thumbnails that allow you to find text passages more easily. In this mode, you can move scenes and filter them by entering a text string in the Filter field at the bottom. Figure 2: Scene view lets you call up individual text segments and move them. Statistics and the open documents appear at the bottom. As soon as you move your pointer to the bottom of the screen, FocusWriter provides an oversight of all opened documents and shows statistics, such as word, character, and page counts. By default, FocusWriter shows just the word count. To enable the other statistics, you can use Settings | Preferences , where you move to the Statistics tab to activate the desired option under Content . To get an indication of the number of pages filled, set the amount of text you want on a single page – characters, paragraphs, or words – in the Page Size section of the dialog. If you're working on a deadline and need to deliver the content at a certain time, you can set a daily goal on the General tab of the Preferences dialog. You can specify, for example, 2000 words or 30 minutes , and these values will show up at the bottom of the screen (Figure 2). You can also set a timer with Tools | Timer .